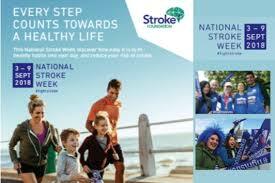 National Stroke Week – Monday 3 to Sunday 9 September 2018. We need to do better: What will we do better? How will we do it? It’s estimated that more than 80 percent of strokes can be prevented simply by managing risk factors and living a healthy lifestyle. There are some risk factors for stroke which can’t be prevented like age, family history and prior stroke. If you’re male, your risk is also higher. There are two ways to approach this: first by talking to your doctor and secondly by taking ownership of your own health. Visit your doctor for a health check to help manage blood pressure, type 2 diabetes and atrial fibrillation (irregular heart beat). Registrations are currently open for the inaugural Institute for Urban Indigenous Health (IUIH) System of Care Conference, to be held on Monday 27 and Tuesday 28 August 2018 in Brisbane. 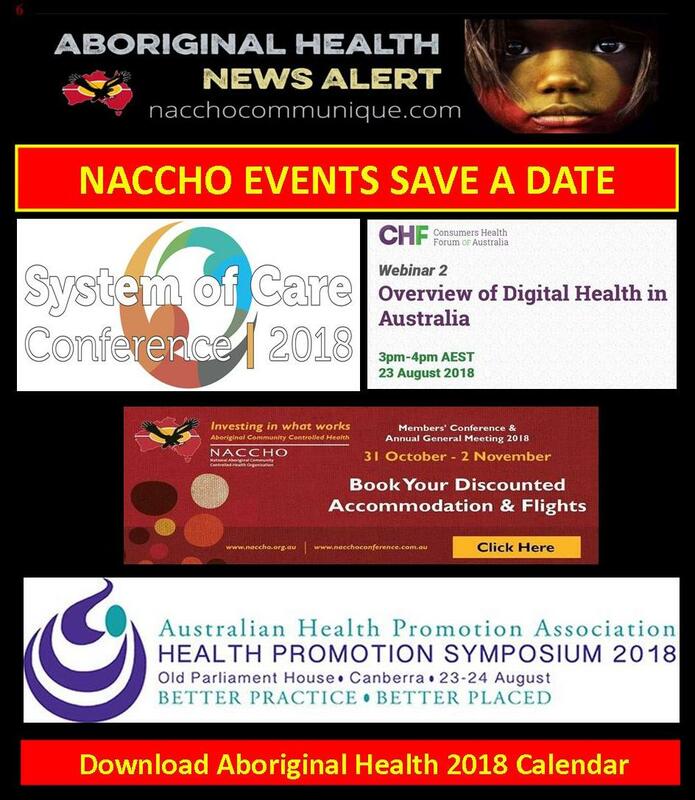 • the NGO sectorCome along and gain fresh insights into the ways in which a cross-sector and integrated system can make real impacts on the health of Aboriginal and Torres Strait Islander peoples as we share the research behind the development and implementation of this system. 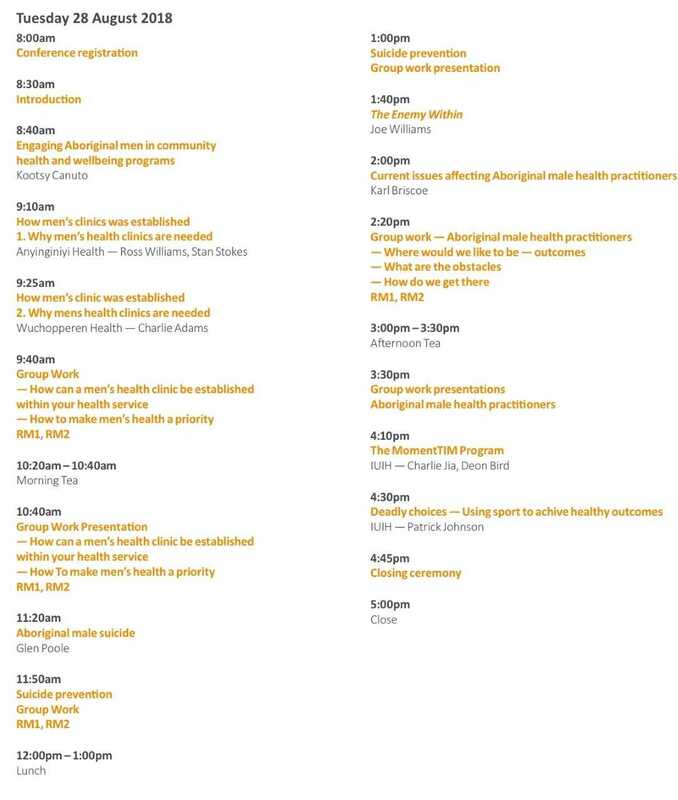 Featuring presentations by speakers across a range of specialisations including clinic set up, clinical governance, systems integration, wrap around services such as allied and social health, workforce development and research evidence. The recent week-long #MensHealthWeek focus offered a “timely reminder” to all men to consider their health and wellbeing and the impact that their ill health or even the early loss of their lives could have on the people who love them. 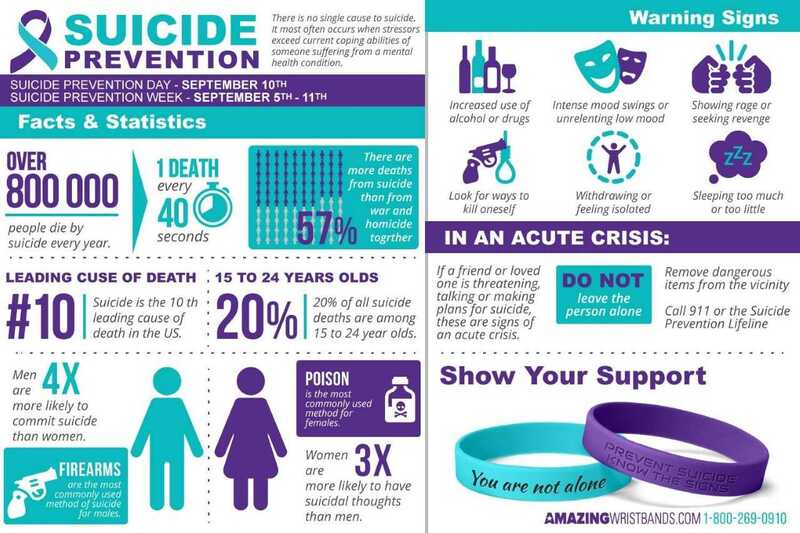 The statistics speak for themselves – we need to look after ourselves better . 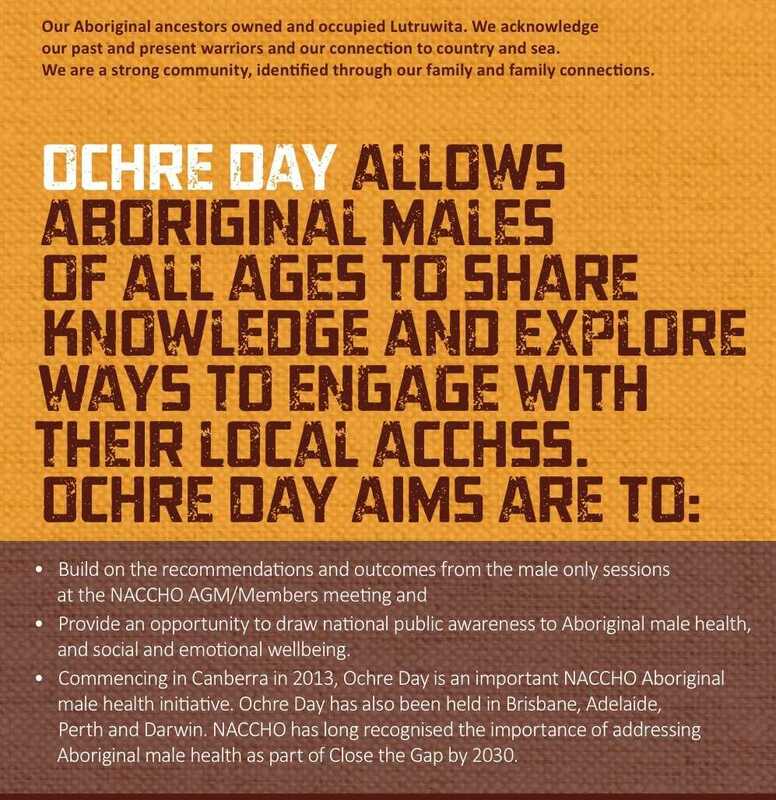 Aboriginal male health is approached negatively, with programmes only aimed at males as perpetrators. Examples include alcohol, tobacco and other drug services, domestic violence, prison release, and child sexual abuse programs. These programmes are vital, but are essentially aimed at the effects of males behaving badly to others, not for promoting the value of males themselves as an essential and positive part of family and community life. 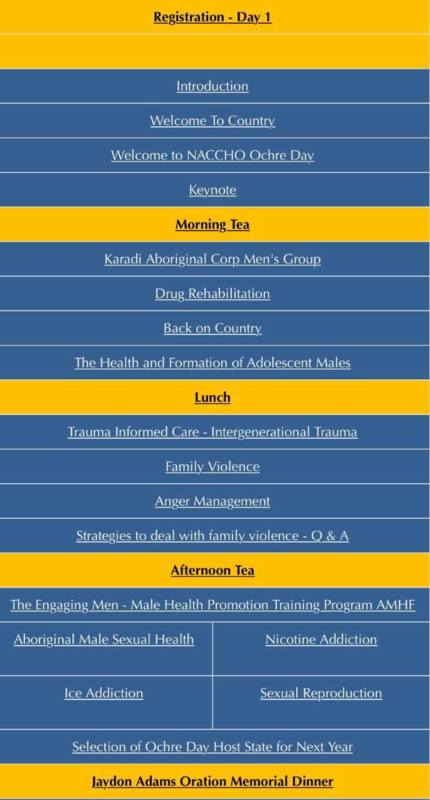 To address the real social and emotional needs of males in our communities, NACCHO proposes a positive approach to male health and wellbeing that celebrates Aboriginal masculinities, and uphold our traditional values of respect for our laws, respect for Elders, culture and traditions, responsibility as leaders and men, teachers of young males, holders of lore, providers, warriors and protectors of our families, women, old people, and children. 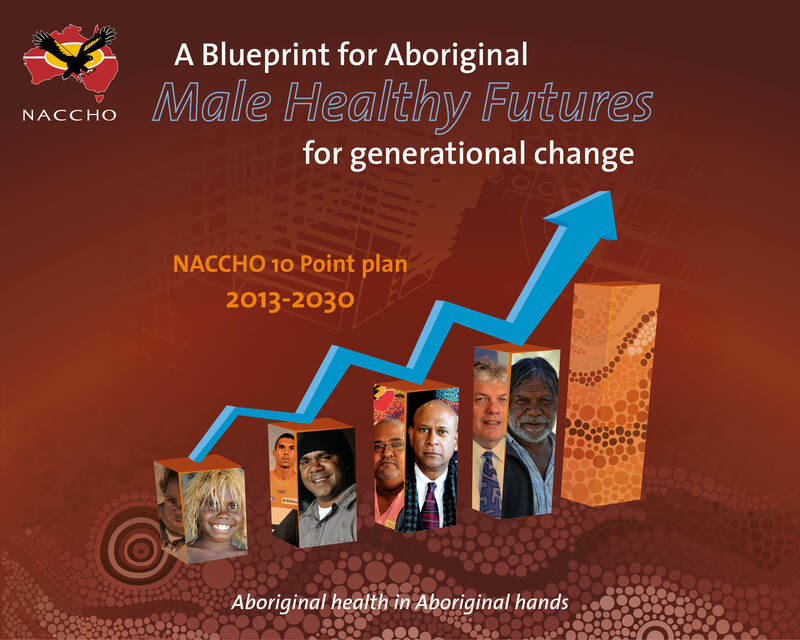 NACCHO’s approach is to support Aboriginal males to live longer, healthier lives as males for themselves. The flow-on effects will hopefully address the key effects of poor male behaviour by expecting and encouraging Aboriginal males to be what they are meant to be. 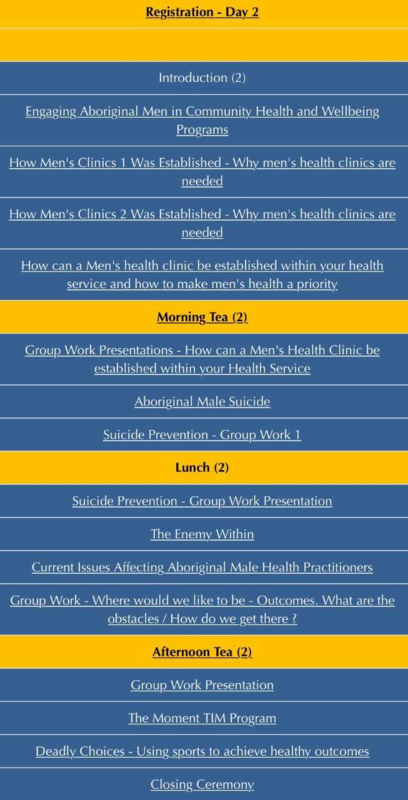 In many communities, males have established and are maintaining men’s groups, and attempting to be actively involved in developing their own solutions to the well documented men’s health and wellbeing problems, though almost all are unfunded and lack administrative and financial support. 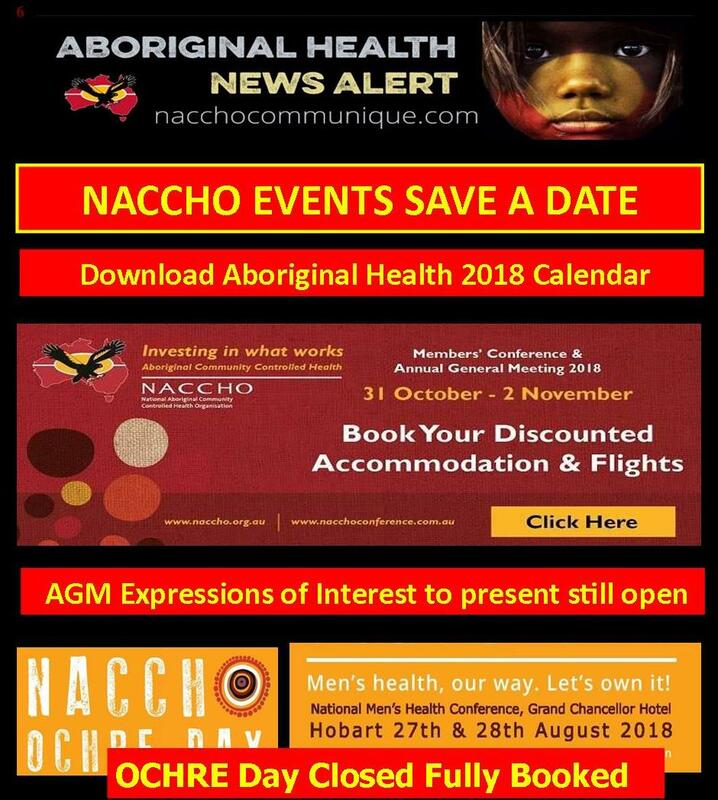 To assist NACCHO to strategically develop this area as part of an overarching gender/culture based approach to service provision, NACCHO decided it needed to raise awareness, gain support for and communicate to the wider Australian public issues that have an impact on the social, emotional health and wellbeing of Aboriginal Males. 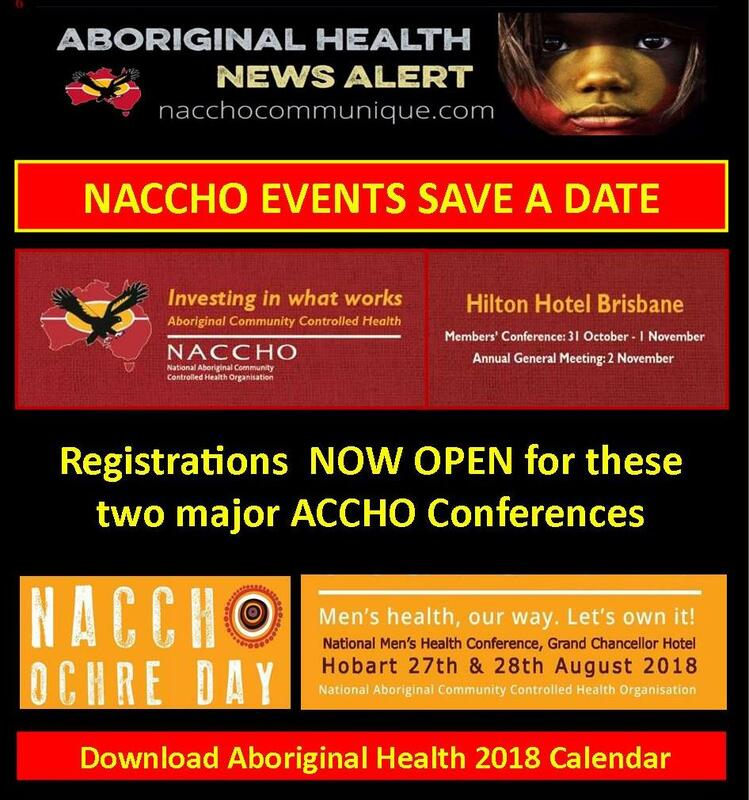 It was subsequently decided that NACCHO should stage a public event that would aim to achieve this and that this event be called “NACCHO Ochre Day”. 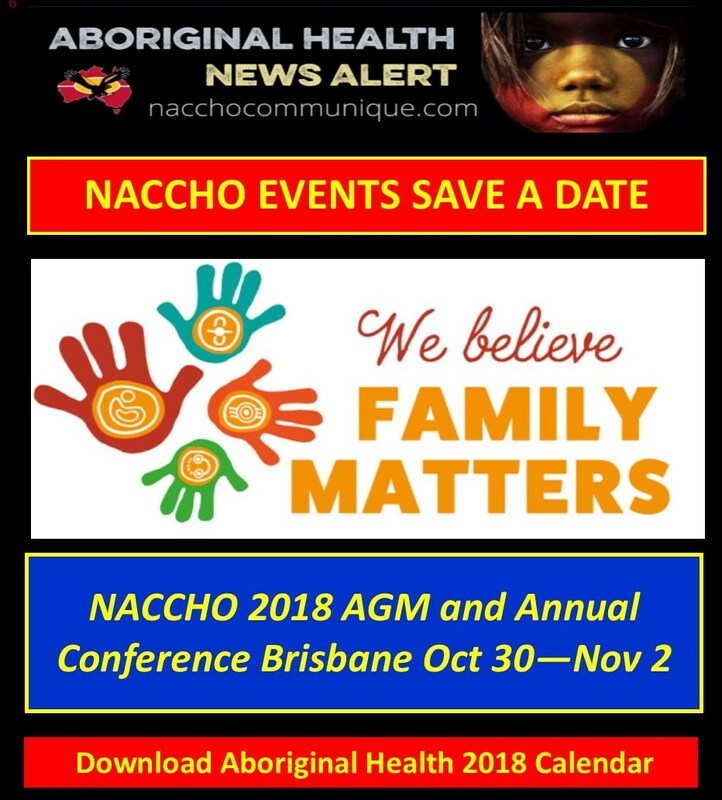 NACCHO is now calling for EOI’s from Affiliates , Member Services and stakeholders for Case Studies and Presentations for the 2018 NACCHO Members’ Conference. This is an opportunity to show case grass roots best practice at the Aboriginal Community Controlled service delivery level. 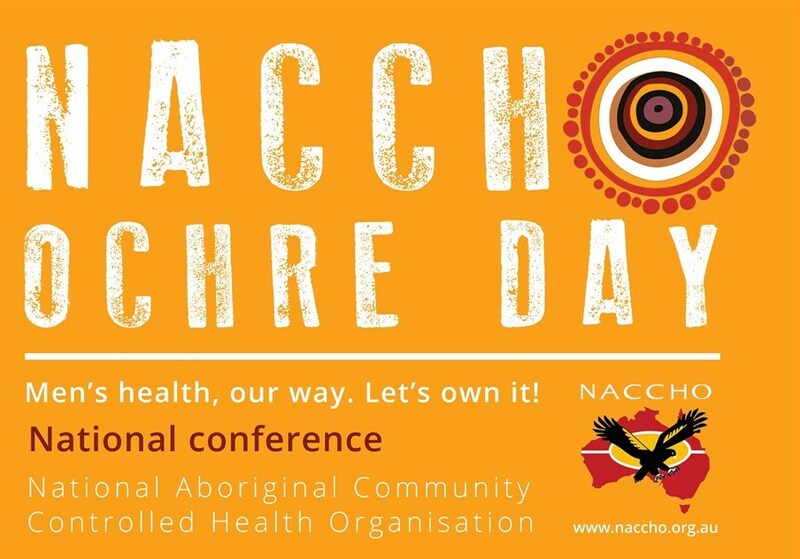 In doing so honouring the theme of this year’s NACCHO Members Conference; ‘Investing in What Works – Aboriginal Community Controlled Health’. We are seeking EOIs for the following Conference Sessions. EOI’s will focus on the title of this session within the context of Urban, Regional, Rural or Remote. Each presentation will be 10-15 minutes in either the Plenary or Breakout rooms. Presenters will speak from the lectern and provide a brief presentation on a key project or program currently being delivered by their service. 5 minutes for discussion and questions from delegates. 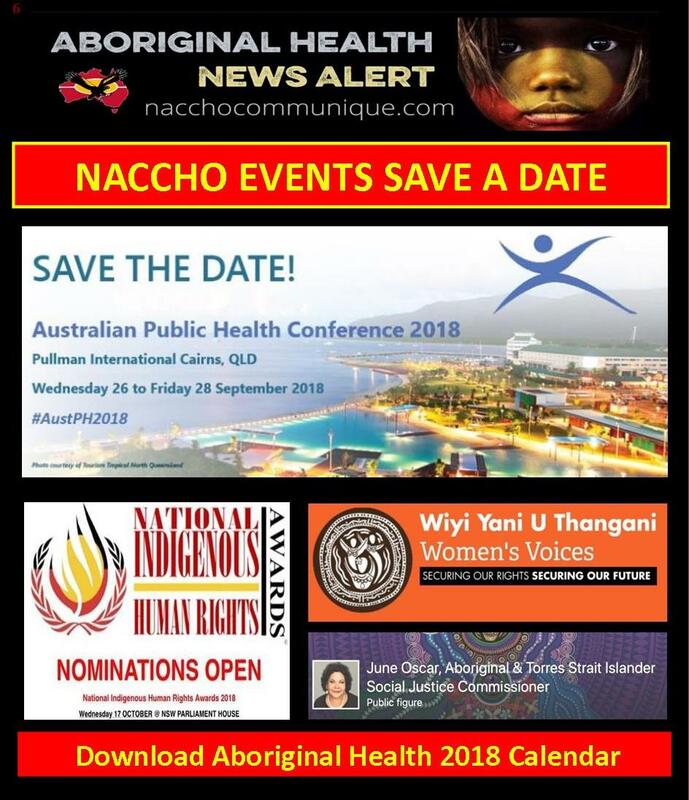 Please provide the following information and submit via email to NACCHO-AGM@naccho.org.au by COB Monday 21st August 2018. 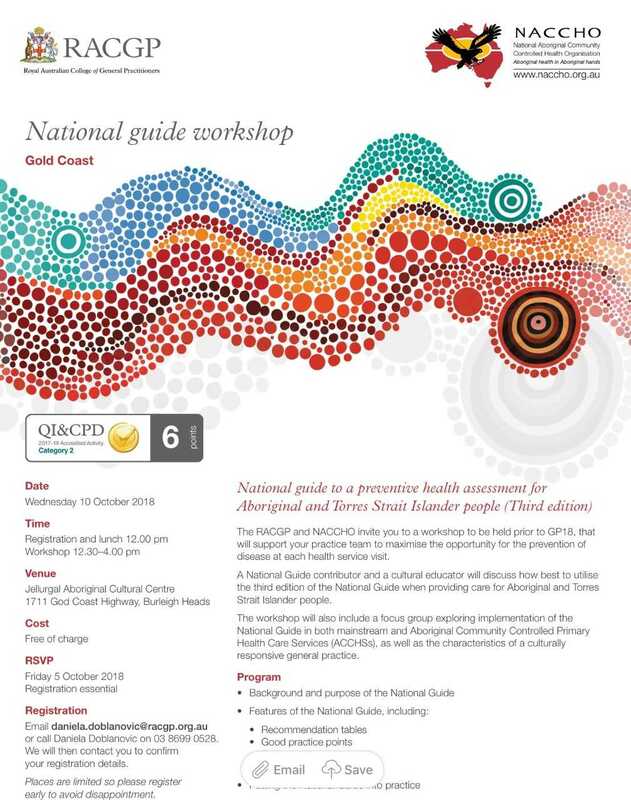 NSW Aboriginal Land Council and the Coalition of Aboriginal Peak Organisations (CAPO) says it is time governments and policy-makers commit to actively engaging the expertise of Aboriginal community controlled organisations. “That is why we are marching on the International Day of the World’s Indigenous Peoples,” said Councillor Roy Ah-See, Chair of NSWALC and Co-Chair of CAPO. “CAPO’s expertise across health, education, cultural and family connections, community care, the legal system and Land Rights spans more than 200 years. Cr Ah-See said that current policy is built on shifting sands, while the knowledge and expertise of Aboriginal community controlled organisations provide the solid foundation for a better future for our people. “That is why it is vital we all take this opportunity to walk together in solidarity and march for Aboriginal Rights and community control on a highly significant day,” Cr Ah-See said. 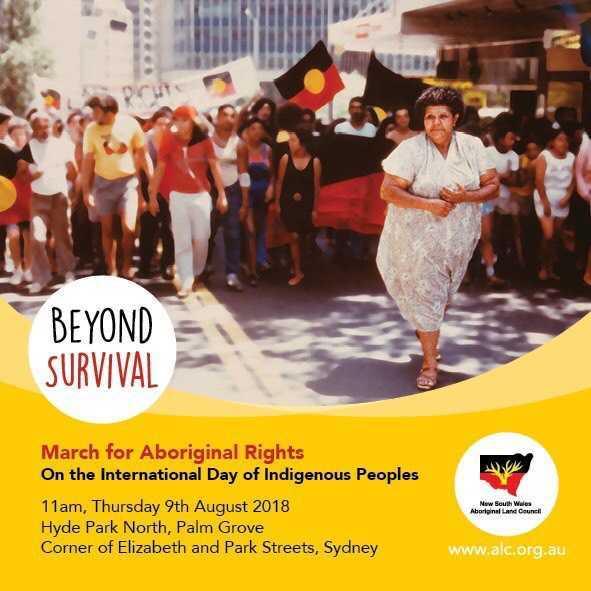 The Beyond Survival March for Aboriginal Rights is on Thursday August 9 at 11am, leaving from Hyde Park North to NSW Parliament House. 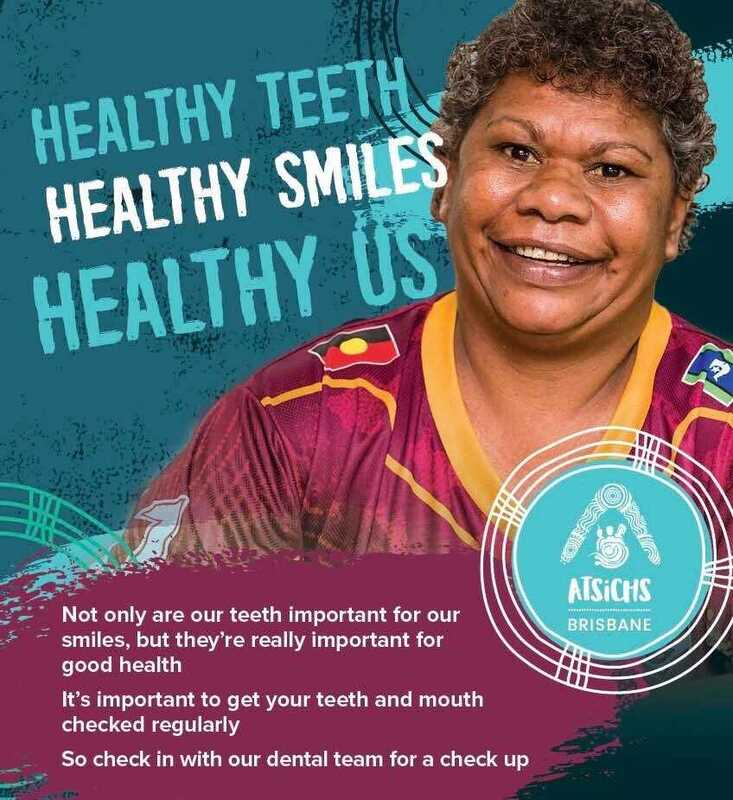 This year during Dental Health Week (6 – 12 August), the ADA is reminding everyone to #WatchYourMouth, in the light of the latest national survey conducted by the Association that showed Australians are not prioritising their oral health. 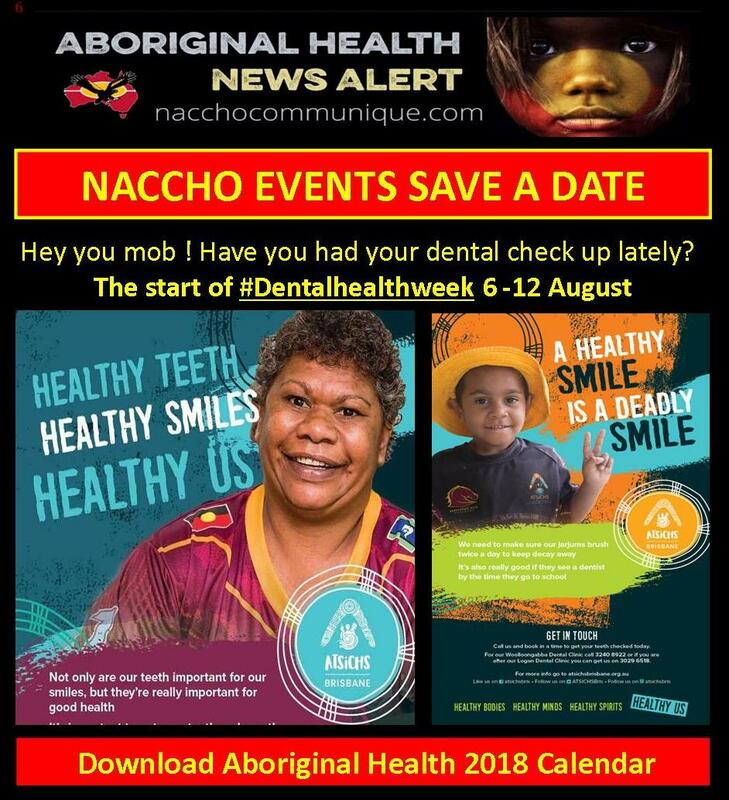 It follows the launch earlier this year by the ADA of Australia’s Oral Health Tracker which was developed in response to data showing that just over 52% of Australians are only brushing once a day instead of the recommended twice daily and nearly two in five (38%) never floss or clean in between their teeth. Australians also need more regular dental check-ups, with 69% only going to the dentist when they have a problem. This is especially concerning given the fact that tooth decay is Australia’s most common disease, with one in five adults having untreated tooth decay and one in five also have gum disease, with oral cancer rates also on the rise. “Quality oral hygiene has always been paramount in my life; it was something we were raised to be very conscious of. Mum would never allow us to go to school or bed without brushing our teeth and our regular dentist check-ups were compulsory. 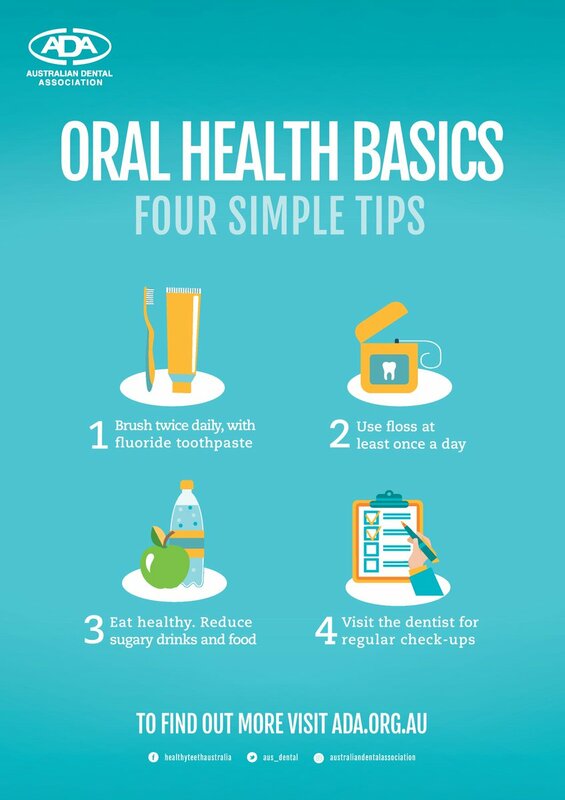 As the Dental Health Week Ambassador, I’m encouraging Australians to watch their mouth and take their oral health seriously. We have two clinics to keep your whole mouth healthy & your smile deadly. be a regular ongoing patient with one of our ATSICHS Brisbane medical clinics and be up to date with your annual health check. 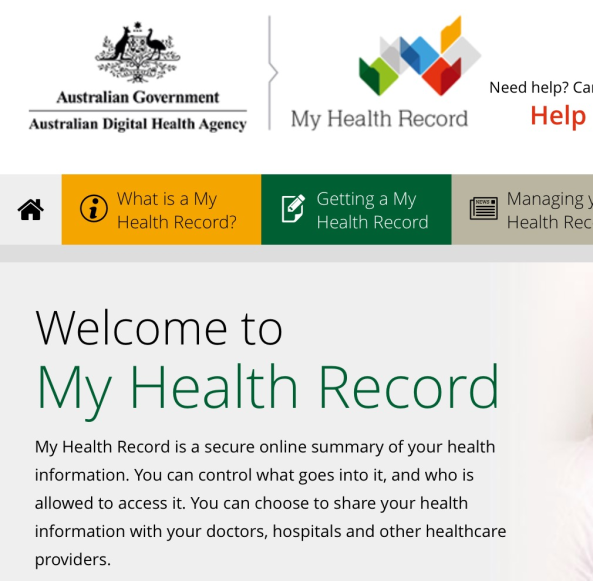 If you are a new patient to ATSICHS Brisbane, our GPs will need to have had a chance to review your medical records. We encourage kids to get their health check prior to their dental appointment. We have a dental van at the Murri School that specialises in children’s dental care. We can also see kids at our two other clinics. If you are a non Indigenous patient with an Indigenous spouse you may be eligible for care. Please contact our dental team for further information. What if I’m not an ATSICHS Brisbane client? If you do not currently attend one of our ATSICHS Brisbane medical clinics, you are invited to transfer your medical records and become a regular ongoing medical patient. You will then become eligible for dental care once your health check is completed. If you prefer not to attend one of our medical clinics, you are unable to access the dental clinics at Woolloongabba or Logan. a private dentist of your choice. There are no fees for the general dental care provided the eligibility criteria is met. Fees do apply for laboratory work, e.g., mouth guards, denture and crown work. Treatment is provided to the majority of children via the Child Dental Benefits Scheme. Aged pensioners are eligible for free acrylic dentures. Our dental team consists of dentists, oral health therapists, dental assistants, dental technicians and a dental prosthetist. We support the training of dental students, by providing clinical placements for final year dental students throughout the year. regular recalls and follow up. Dental services are available at our Woolloongabba and Logan clinics. All services are provided in the clinics and staff are supportive of visiting and participating in community days and other special events to provide information on dental care and disease prevention. 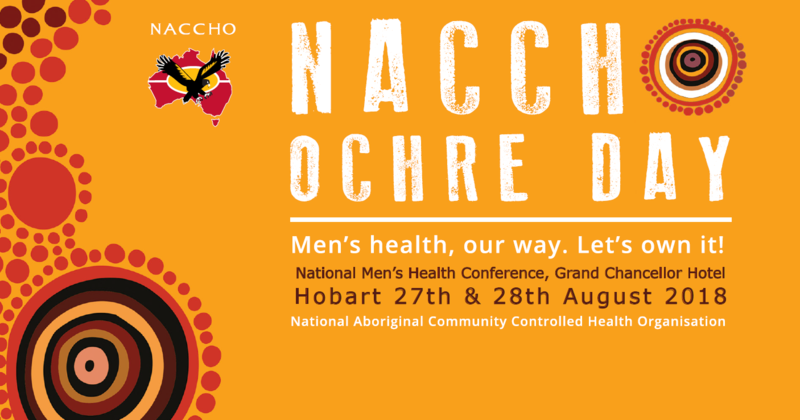 All too often Aboriginal male health is approached negatively, with programmes only aimed at males as perpetrators. Examples include alcohol, tobacco and other drug services, domestic violence, prison release, and child sexual abuse programs. These programmes are vital, but are essentially aimed at the effects of males behaving badly to others, not for promoting the value of males themselves as an essential and positive part of family and community life. 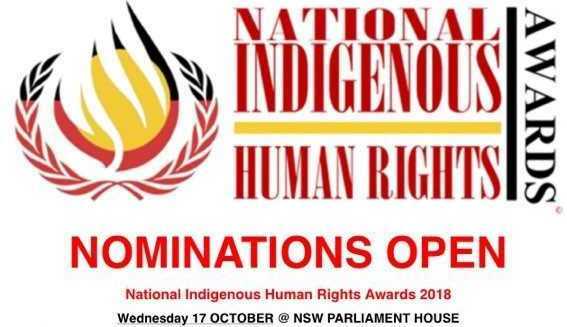 Nominate our members’ outstanding contributions towards improving the health and life outcomes of Aboriginal and Torres Strait Islander Peoples. NAIDOC Week celebrations will kicked off yesterday highlighting the histories, rich cultures, and outstanding achievements of Aboriginal and Torres Strait Islander peoples. The 2018 theme #Becauseofherwecan highlighted the past and present contributions of Aboriginal and Torres Strait Islander women. 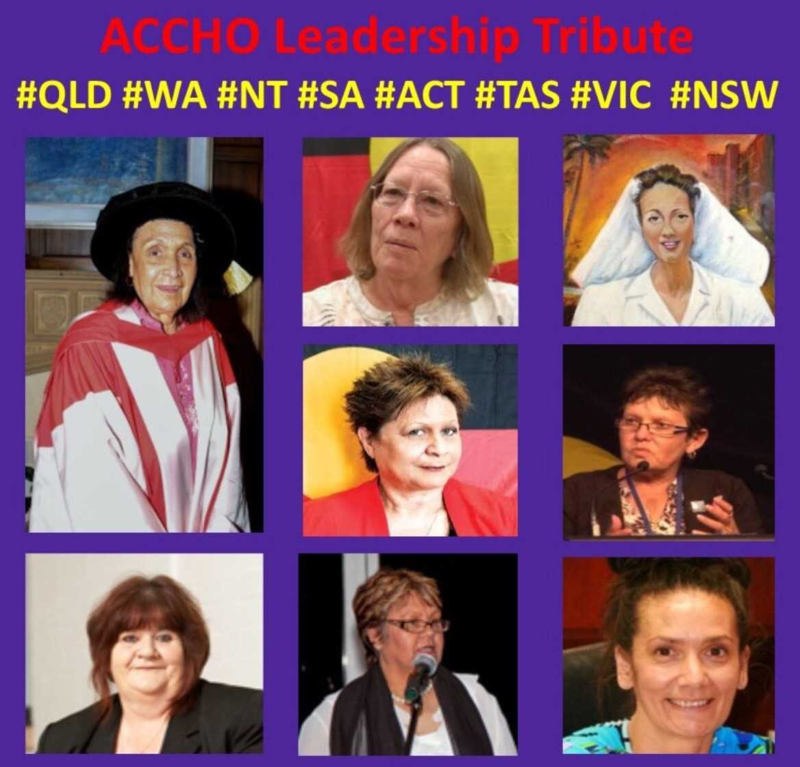 These woman in our Part 1 and 2 tribute today represent the 45 years of ACCHO’s advocating for culturally respectful, needs based approach to improving the health and wellbeing outcomes of our people in the past and now into our healthy futures. Mum Shirl was born as Coleen Shirley Smith in the Erambie Mission, near Cowra in 1921 to Joseph and Isabell Smith. She did not attend a regular school because of her epilepsy and was taught by her grandfather and learned 16 different Aboriginal Languages. She began to visit Aboriginal people in jail after one of her brothers was incarcerated and she discovered that her visits were beneficial to other prisoners as well. Her community activism also saw her accompanying indigenous people who were unfamiliar with the legal system to court when they had been charged with a crime. Her nickname came from her habit of replying, “I’m his mum” whenever officials queried her relationship with the prisoners – the name by which she became widely known. 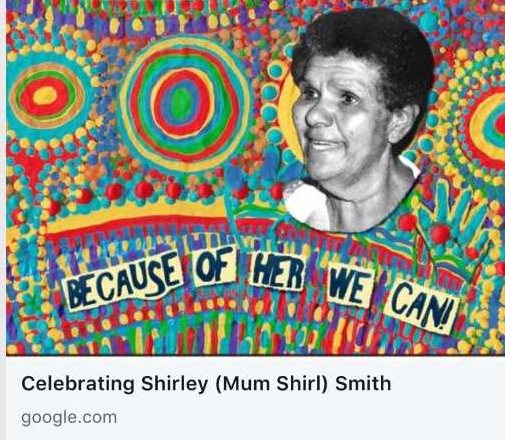 Because of her work visiting Aboriginal prisoners, Mum Shirl is the only woman in Australia to have been given unrestricted access to prisons in New South Wales. “She’d be at one end of the state one day, and seen at the other end of the state the next day. The department wasn’t getting her from A to B. She used to rely on family and friends to get her around,” said Ron Woodham from NSW Corrective Services. Later the Department of Corrective Services revoked her pass, making her prisoner support work near impossible. Smith’s welfare work, however, was not confined only to prisons and the legal system. She also spent considerable time and money finding homes for children whose parents could not look after them, and helping displaced children to find their own parents again. The children with nowhere to go often ended up living with her. By the early 1990s she had raised over 60 children. Likewise, many people with no family or friends in Sydney arrived at Mum Shirl’s Redfern house seeking shelter. In 1970, Smith, along with Ken Brindle, and Chicka and Elsa Dixon, were the guiding force behind a group of young Aboriginal men and women who were involved in the campaign for land rights by the Gurindji people. 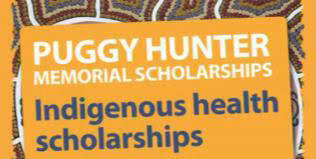 This same group, with Fred Hollows and others helped to establish Aboriginal Medical Service in July 1971. They also helped establish the Aboriginal Legal Service in 1971, the Aboriginal Black Theatre, the Aboriginal Tent Embassy, the Aboriginal Children’s Service, the Aboriginal Housing Company and the Detoxification Centre at Wiseman’s Ferry. WA : Vicki O’Donnell. Chair AHCWA : CEO – Kimberley Aboriginal Medical Services. NAIDOC Week celebrations will kick off today, highlighting the histories, rich cultures, and outstanding achievements of Aboriginal and Torres Strait Islander peoples. Minister for Indigenous Affairs, Nigel Scullion said that the 2018 theme highlighted the past and present contributions of Aboriginal and Torres Strait Islander women. 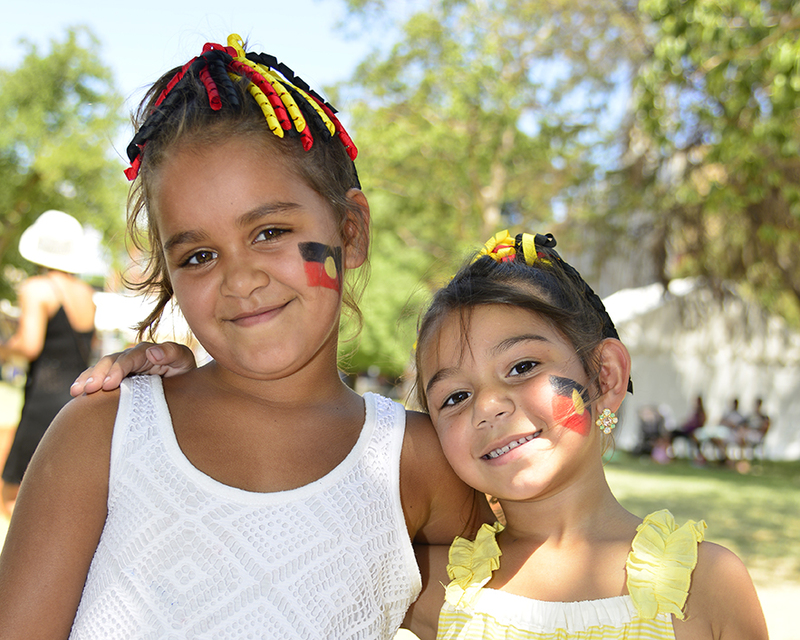 “NAIDOC Week is an opportunity to celebrate the achievements of Aboriginal and Torres Strait Islander women – who are strong role models and leaders in their homes, communities and society more broadly,” said Minister Scullion. “The Turnbull Government proudly supports NAIDOC Week each year, and I am pleased to announce that a record number of organisations have received funding to celebrate 2018 NAIDOC Week. This year, 528 organisations received grants through the Turnbull Government’s 2018 NAIDOC Week grants round. The 2018 NAIDOC Week grants will support a variety of events in all states and territories, including a NAIDOC Touch Football Cup, historical recordings, art workshops, and cultural showcases and a Koori Cook Off. 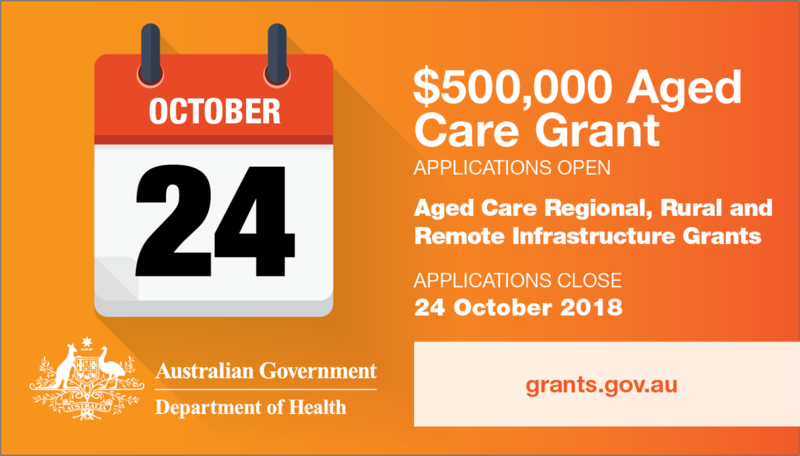 “These grants support communities across the country to hold their own events, spreading understanding and pride of Aboriginal and Torres Strait Islander cultures – the oldest continuing culture in the world. Many of the 2018 NAIDOC Week grant recipients will hold events in honour of the theme, including the Celebrating Tiwi Women Awards, the Djab Wurrung Women Elders event in Budja Budja, Victoria and a women’s story telling film and portrait exhibition project in Ballarat. The week will culminate in the National NAIDOC Awards Ceremony, held in Sydney on 13 July to recognise the outstanding contributions of Aboriginal and Torres Strait Islander peoples in their communities and beyond. The Turnbull Government is also supporting Aboriginal and Torres Strait Islander women every other week of the year through culturally appropriate, place-based and Indigenous-led services delivered mostly through Indigenous owned and controlled organisations as part of the $5 billion Indigenous Advancement Strategy (IAS). Through the IAS we are investing $41 million in women and girls specific education programmes, more than $140 million in domestic violence prevention and support measures, in addition to the $100 million Third Action Plan, as well as a range of health and cultural initiatives for Aboriginal and Torres Strait Islander women. The Turnbull Government is proud to be partnering with the Aboriginal and Torres Strait Islander Social Justice Commissioner, Ms June Oscar AO, who in February this year commenced a landmark national consultation process with Aboriginal and Torres Strait Islander women and girls. 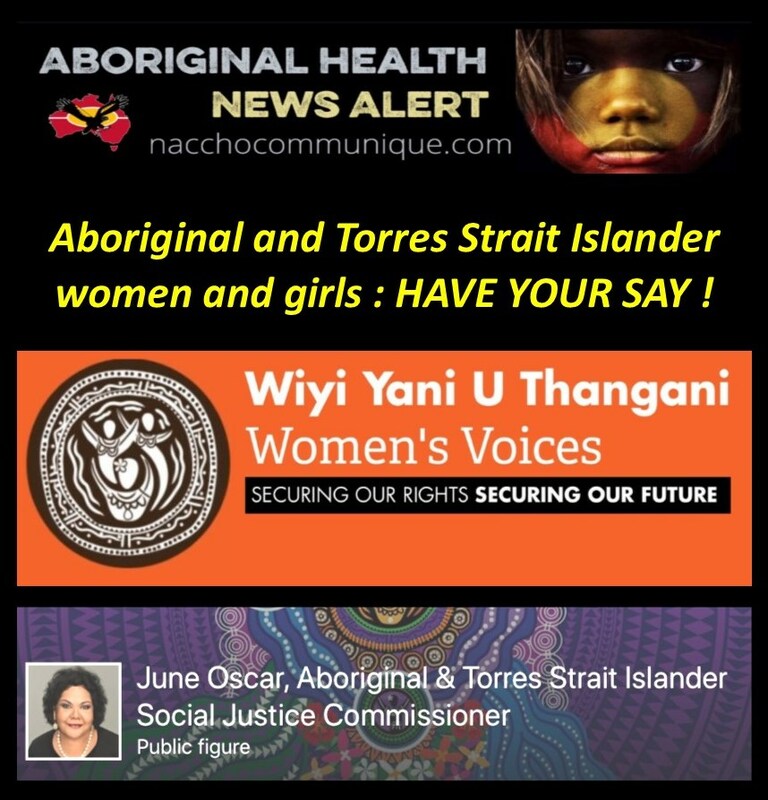 The Wiyi Yani U Thangani (Women’s Voices) project commissioned by Minister Scullion is a national conversation with Aboriginal and Torres Strait Islander women and girls’ to understand their priorities, challenges and aspirations. Findings will inform key policies and programs such as the Closing the Gap refresh, future investment under the Indigenous Advancement Strategy and development of the Fourth Action Plan of the National Plan to Reduce Violence Against Women and Their Children. Consultations are continuing through to November 2018. Dr Jackie Huggins will be hosting these engagements on behalf of the Commissioner. 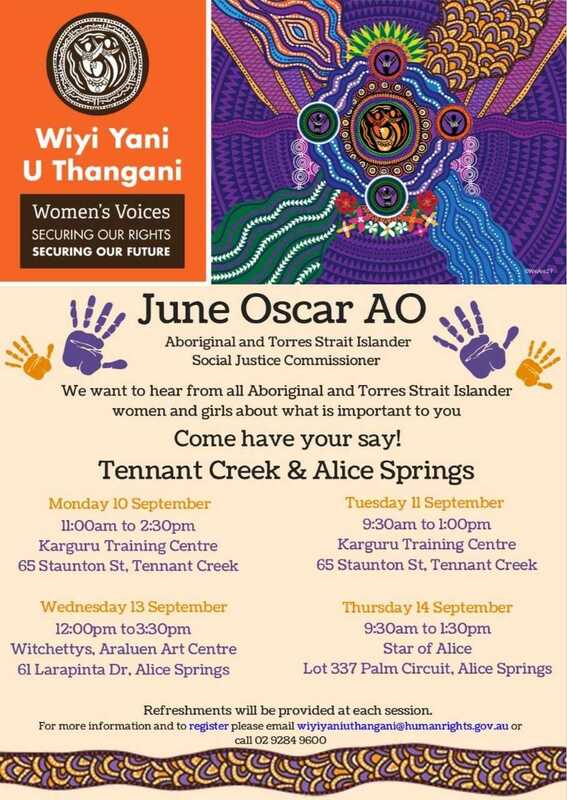 Dr Huggins and the team will be speaking with Aboriginal and Torres Strait Islander women (18+) and girls (aged 12-17) through a series of community gatherings across the country, to hear directly about their needs, aspirations and ideas for change. Please see details and registration options below. Please join us for one of the following sessions and register by clicking on the relevant link. You can also email us at wiyiyaniuthangani@humanrights.gov.au or phone us on (02) 9284 9600. 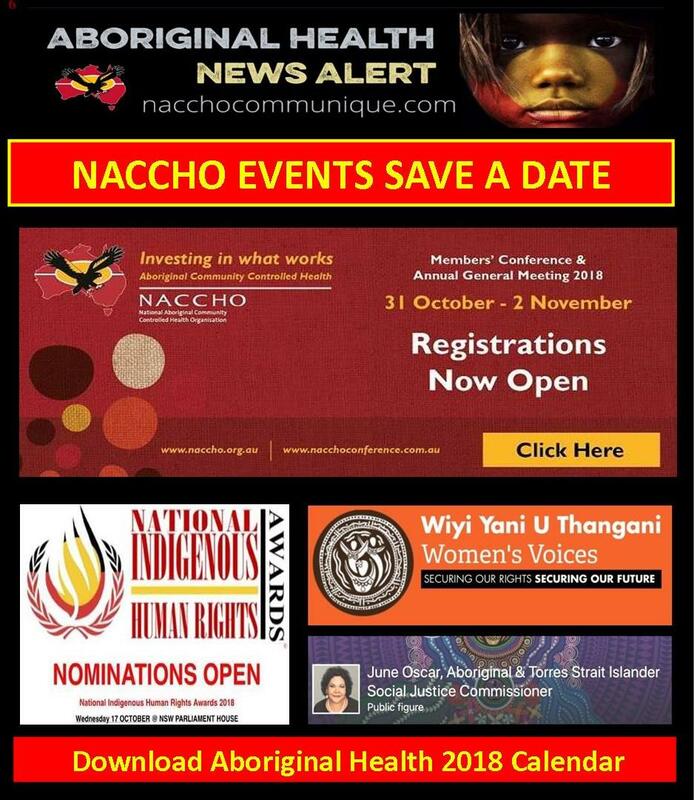 To find out more about NAIDOC Week and events in your community, visit naidoc.org.au. 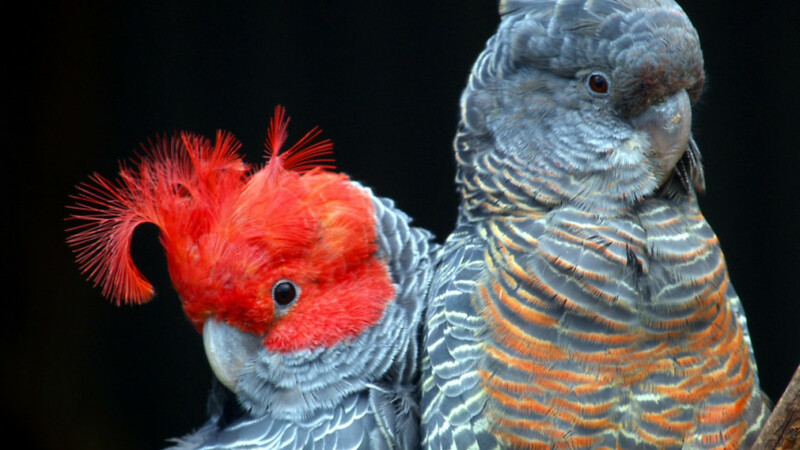 Book your early bird conference registrations before 30 June and save money per delegate. 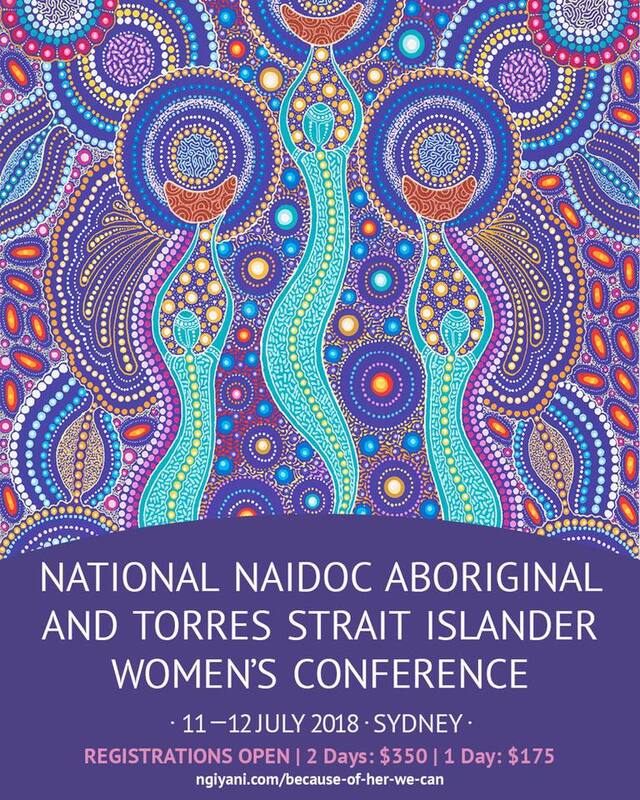 July 11-12 National NAIDOC Aboriginal and Torres Strait Islander Woman’s Conference in Sydney. 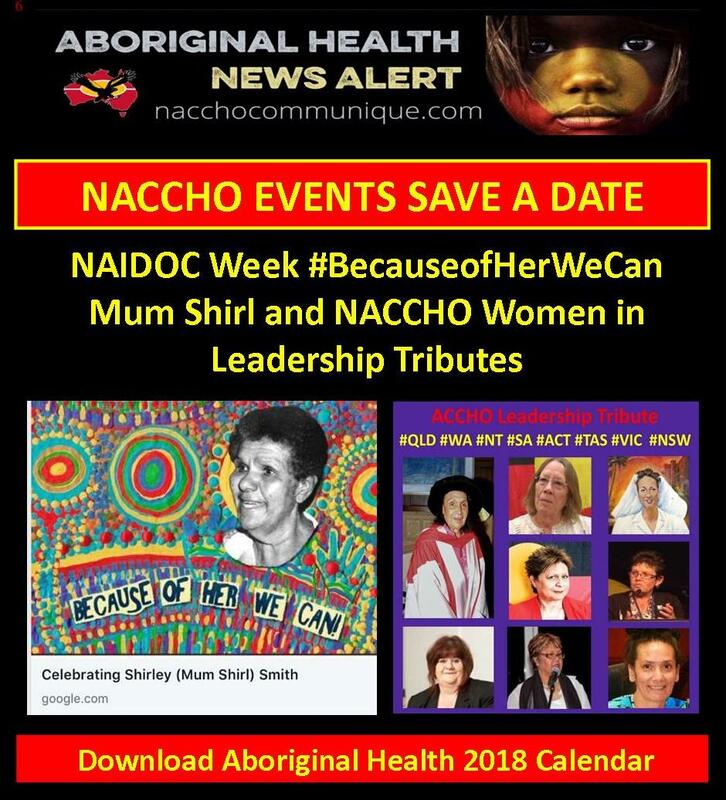 When the National NAIDOC Committee announced the 2018 Theme: Because of Her, We Can in November 2017 there was a huge round of applause around Australia particularly from Aboriginal and Torres Strait Islander Women. Amongst those women were Christine Ross, Sharon Kinchela and Chris Figg who all agreed we needed to celebrate this fabulous theme. 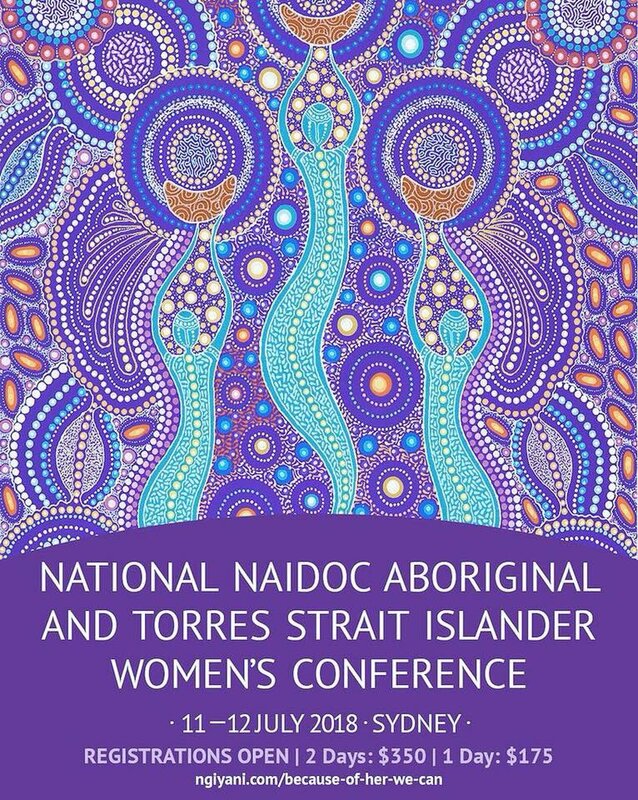 So, with great excitement Ngiyani Pty Ltd announced they would host a National NAIDOC Aboriginal and Torres Strait Islander Women’s Conference to be held on 11 – 12 July 2018 at UNSW Kensington Campus Sydney. They are utlising the services of Christine Ross Consultancy as the Project Manager. 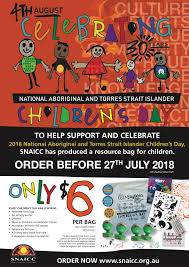 The theme for Children’s Day 2018 is SNAICC – Celebrating Our Children for 30 Years. This year, we invite communities to take a walk down memory lane, as we revisit some of the highlights of the last 30 years. We look back on the empowering protest movements instigated by community that had led to the establishment of the first Children’s Day on 4 August 1988. We look back at all of the amazing moments we’ve shared with our children over the years, and how we’re watching them grow into leaders. We look back to see what we’ve achieved, and decide where we want to go from here to create a better future for our children. If you have celebrated Children’s Day at any time during the past 30 years, we would love to hear from you. As Australia’s national university, ANU has an obligation to constructively contribute to the discussion of policy reform and processes of significant issues concerning Indigenous Australia. The University seeks to reignite national debate about Australia’s First Nations governance models and their contribution to policy. 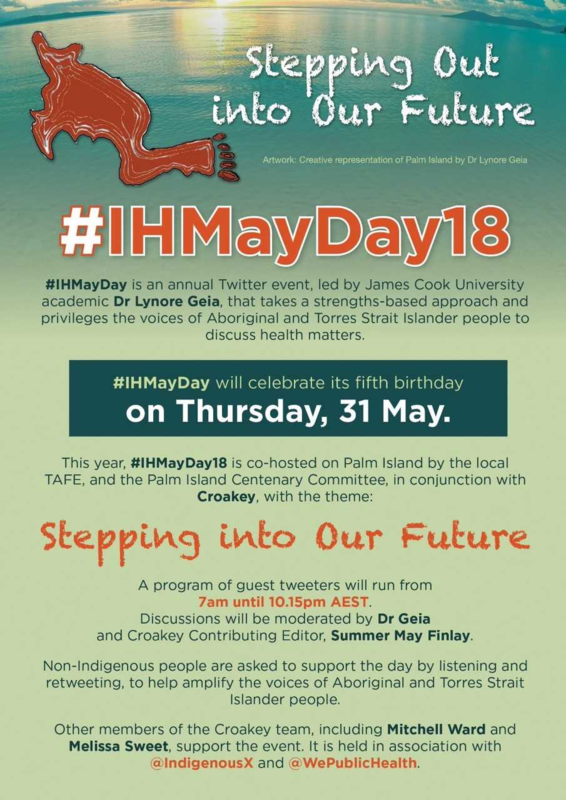 We are in a unique position to facilitate an International Indigenous-led discussion, with academic rigour, on some of the most challenging issues affecting the country. We recognise that the academic expertise on these issues is distributed among universities around Australia and the world and welcomes contributions from interested parties. In 2018 ANU will host the First Nations Governance Forum with a goal to provide a series of policy options relevant to Australia through learning from models in other colonial settler states that demonstrate Indigenous peoples leadership in the governance of their affairs. The Forum will include a welcome dinner, keynote presentations, a series of high-level panel discussions and workshop sessions. 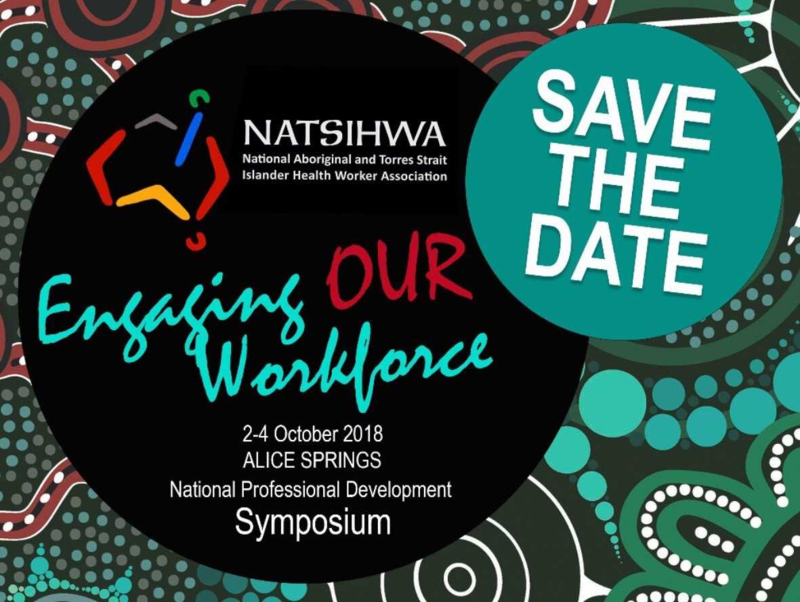 The Forum will be hosted with the support of Australia’s Federal Indigenous parliamentarians, Indigenous leaders, academics, government, leading international policy makers and other interested stakeholders. The Forum will consider First Nations governance reform in Australia and, share the experiences of Indigenous people in comparable jurisdictions including Aotearoa (New Zealand), Canada, USA and Scandinavian countries. 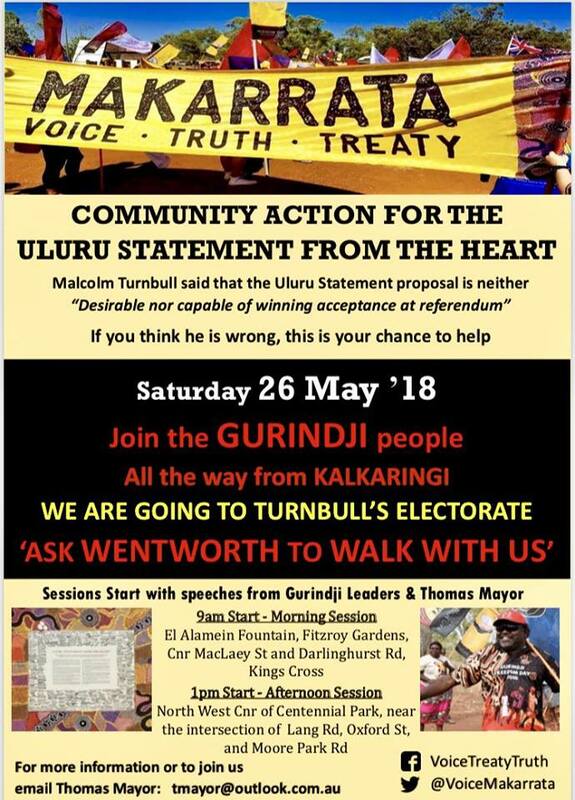 The Forum will build on the extensive work undertaken on this issue including the Report of the Expert Panel on Recognising Aboriginal and Torres Strait Islander Peoples in the Constitution (2012), the Report of the Joint Select Committee on Constitutional Recognition of Aboriginal and Torres Strait Islander Peoples (2015) and the Uluru Statement from the Heart (2017). Broad participation in the Forum from across the community is encouraged and supported. The Forum is a public event. Attendance is free (though attendees will be responsible for their own expenses including travel, accommodation and meals). The Forum will also be live-streamed and recorded to ensure remote access. An Expression of Interest process will be conducted for a limited number of seats available at the Museum of Australian Democracy. Complete the Expression of Interest form by 13 June. Applicants will be selected across representative groups and notified in the first week of June. A facilitated, live-streamed broadcast will be hosted at Llewellyn Hall on the ANU campus. Those who are unsuccessful in registering a place at the Museum of Australian Democracy are encouraged to register to attend this event at Llewellyn Hall. The Forum will also be live-streamed across the internet, ensuring access for everyone. Register your interest to participate in the national live-stream. * Note: the Forum is a public event and will be live-streamed and recorded, and research may be conducted using data obtained from the event. Live-stream analytics data from the event may be collected and used in research. 8 July : Because of Her, We Can! 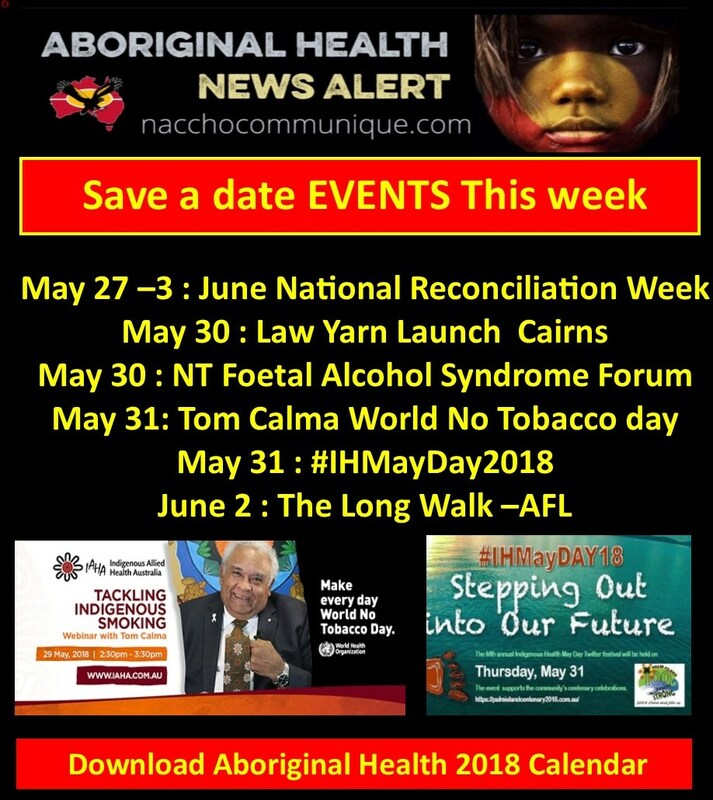 – NAIDOC Week 2018 will be held nationally from Sunday 8 July and continue through to Sunday 15 July. 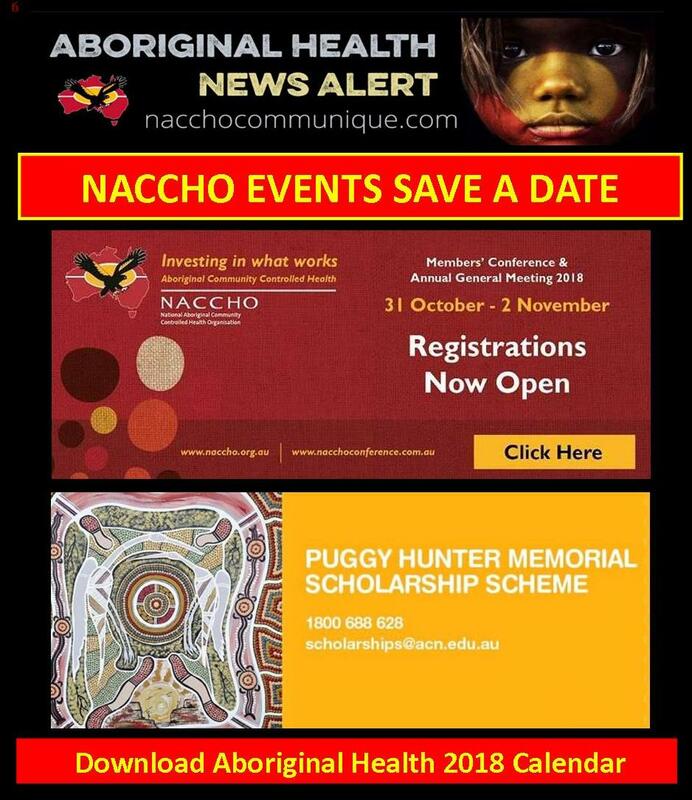 Download the National NAIDOC Logo and other social media resources. A new ad campaign that questions how much the average Australian knows about the country’s history will hit screens today in the lead up to National Reconciliation Week. The 30-second and 60-second ads show a non-Indigenous man enjoying a game of football, before he starts to address the audience. “Oh g’day, I’m just your average Australian. I’m just doing average Australian things like watching Australian football with my Australian Shepherd,” he says. The man says he knows quite a bit about our country – including that we have the “tastiest coat of arms in the world” – before he is interrupted by an Aboriginal woman. “There’s also a bit that you don’t know. We’ve got the longest surviving culture on earth,” the woman says. “Just your average artists,” an Aboriginal man chimes in. “Warriors,” another Aboriginal woman says. “Inventors,” a third Aboriginal woman offers. The ad campaign highlights some of the lesser known aspects of Aboriginal and Torres Strait Islander histories, cultures and achievements, to prompt Australians to ask themselves: what are some of the things I don’t know about our shared history? Australians will be asked to ponder that question during this year’s National Reconciliation Week (27 May – 3 June), which is themed Don’t Keep History a Mystery: Learn. Share. Grow. Many Australians are unaware of, or reject, fundamental aspects of history, according to the Australian Reconciliation Barometer. The biennial survey commissioned by Reconciliation Australia and conducted by Polity social research consultancy explores the perceptions of a representative sample of Australians in order to gauge progress towards reconciliation. 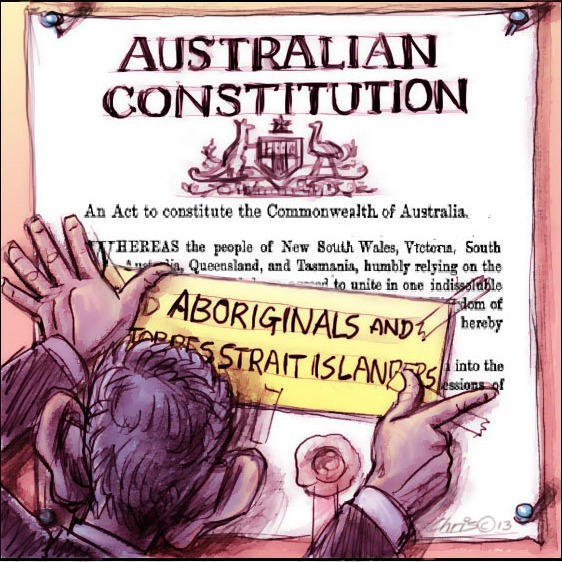  Almost one in three Australians do not accept that government policy enabled Aboriginal and Torres Strait Islander children to be removed from their families without permission until the 1970s.  More than one in three Australians do not accept that Aboriginal and Torres Strait Islander people were subject to mass killings, incarceration, forced removal from land and restricted movement, throughout the 1800s. Reconciliation Australia CEO Karen Mundine said National Reconciliation Week would raise awareness of the fact that historical acceptance is key to reconciliation. 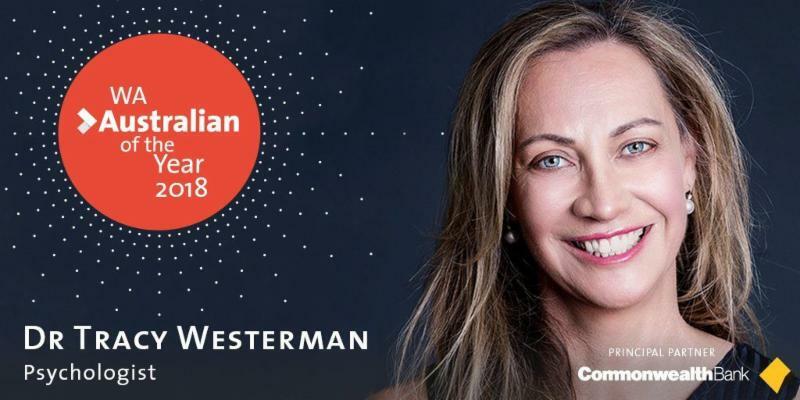 “It’s essential that we know each other, and that we share an understanding of the history that has shaped the relationship between wider Australia and Aboriginal and Torres Strait Islander peoples as it stands today,” she says. The National Reconciliation Week ads will be screened on SBS, NITV, Foxtel and ICTV, in cinemas nationally, on Qantas in-flight entertainment, and on big screens in Brisbane’s Queen St Mall and King St Mall, Melbourne’s Federation Square, and Sydney’s Pitt Street mall. 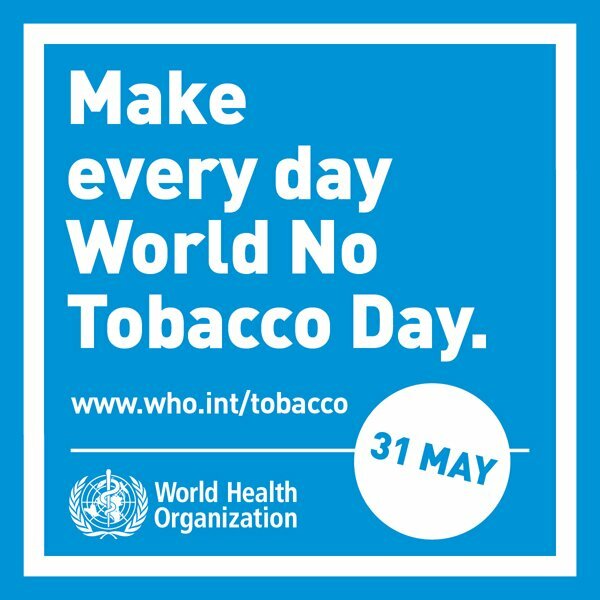 In the lead up to World No Tobacco Day, IAHA will host a live online webinar with Patron and National Coordinator Tackling Indigenous Smoking Professor Tom Calma to discuss the role of allied health in tackling Indigenous smoking. ABOUT: On 27 May 2018 the residents of Canberra will enjoy a public holiday, Reconciliation Day, to recognise and celebrate reconciliation in the ACT between Aboriginal and Torres Strait Islander people and non-Aboriginal people. This seminar will explore the extent to which genuine and sustainable progress has been made in achieving reconciliation in the ACT. Discussion will centre on a range of data, summarised below, which reflects the extent to which Aboriginal people in Canberra continue to experience disadvantage and of the adequacy of the local response to these matters, including the degree of self-determination accorded the Aboriginal community. This IGPA seminar is co-sponsored by Winnunga Nimmityjah AHCS and is jointly convened by Professorial Fellow Jon Stanhope AO and Adjunct Professor Dr Khalid Ahmed PSM. Aboriginal & Torres Strait Island peoples share their voice, aspirations, hopes, dreams, pathways, taking the steps further for our future. 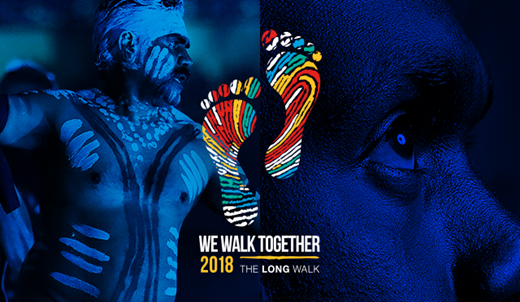 Come and join us on the 2nd of June down at Federation Square from 2:00pm – 5:30pm for The Long Walk 2018. As we embark on our 14th year since Michael Long began his walk towards Canberra we are as excited as ever to celebrate our event. You will be entertained by some of Australia’s best Aboriginal and Torres Strait Islander talent including our MC Leila Gurruwiwi, crowd favourites The Indigenous Hip Hop Crew, enjoy some classics from Blackfire, Birdz, Soul Chic, Russell Robertson & Phil Cebrano and the Brolga Boys. There will be a range of Sporting and Cultural activities as well as a delicious community BBQ. Then “We Walk Together” with Michael Long for the annual Walk to “G” for the Dreamtime Game at 5:30pm sharp. 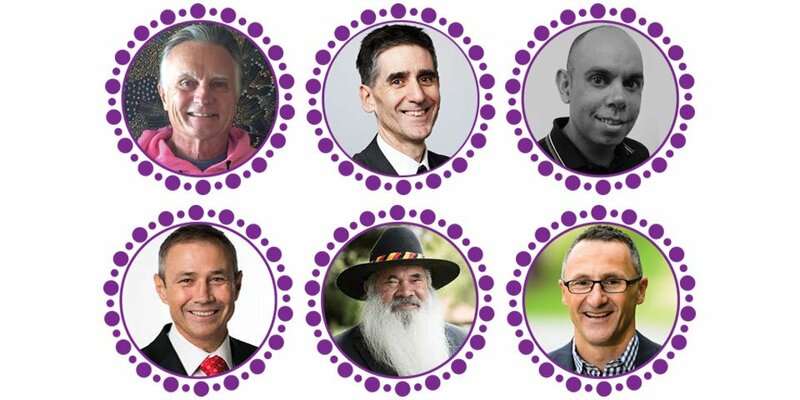 A new committee met yesterday, to further consider matters regarding recognition of Australia’s indigenous people, and will be co-chaired by Senator Patrick Dodson, Senator for Western Australia, and Mr Julian Leeser MP , Member for Berowra. The Joint Select Committee on Constitutional Recognition Relating to Aboriginal and Torres Strait Islander Peoples is expected to report by the end of November this year, with an interim report due in July. The Committee is calling for submissions and is considering options for public meetings and hearings. Co-Chairs Senator Dodson and Mr Leeser MP said: ‘As a committee, we are looking for common ground and ways forward on these critical matters for Australia’s future. We hope to hear from Australians about the next steps for recognition of First Nations peoples. The Committee website has details of Committee membership, and will be the first point of information about the work of the Committee. Written submissions should be received by Monday 11 June, to assist with planning meetings and hearings, but the Committee may accept submissions after this date. Interested members of the public may wish to track the committee via the website. 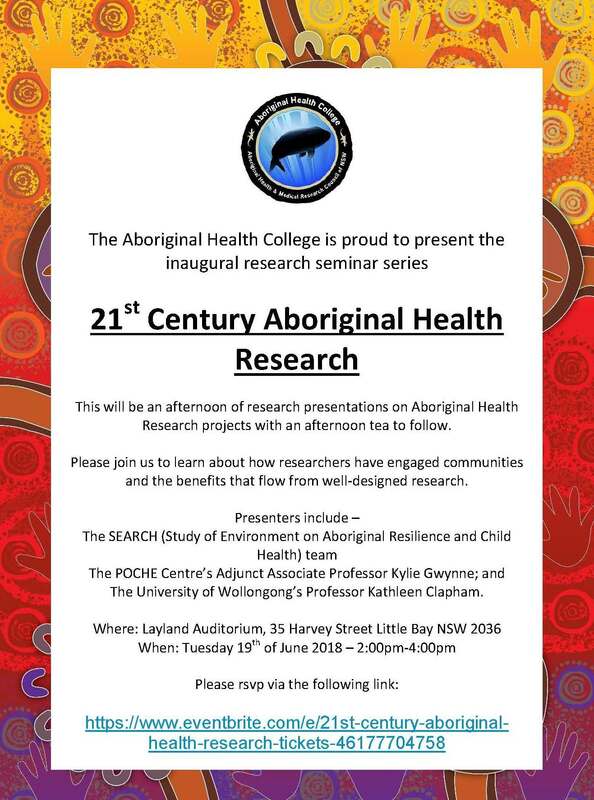 The Aboriginal Health College is thrilled to be hosting a showcase of Aboriginal Health Research projects. 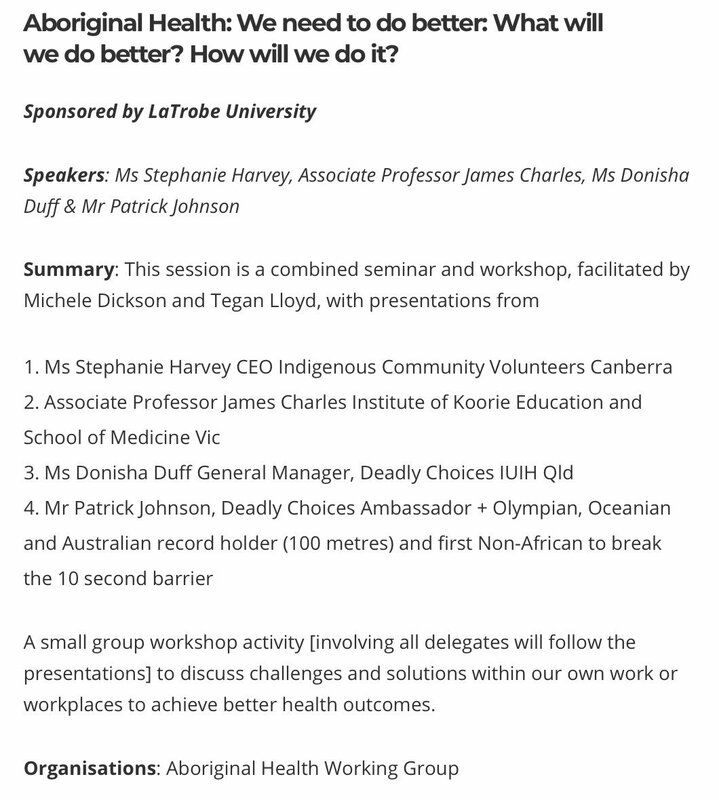 This event is the first in a series of educational seminars promoting best practice in Aboriginal Health Research by exploring community engagement, Aboriginal Governance, evidence-based practice and how researchers achieved success working with community. Please join us to hear from the SEARCH team at the Sax Institute, the POCHE Centre’s Adjunct Associate Professor Kylie Gwynne and University of Wollongong’s Professor Kathleen Clapham. The Family Matters Week of Action started Monday 14 May. The Week of Action is an annual opportunity to shine a light on the 17,000+ Aboriginal kids in the child protection system across the country. It’s a time to remind our politicians as well as members of the public that it’s not acceptable for child protection authorities to remove Aboriginal kids from their families 10 times more than non-Indigenous children. But it’s also a time for optimism, because we have promising solutions to build a better system based on self-determination. During this week, we’ll highlight the fundamental issues that affect Aboriginal and Torres Strait Islander children. Most importantly, we’re working to shine a light on the disconnection of Aboriginal and Torres Strait Islander children from community, culture and country. 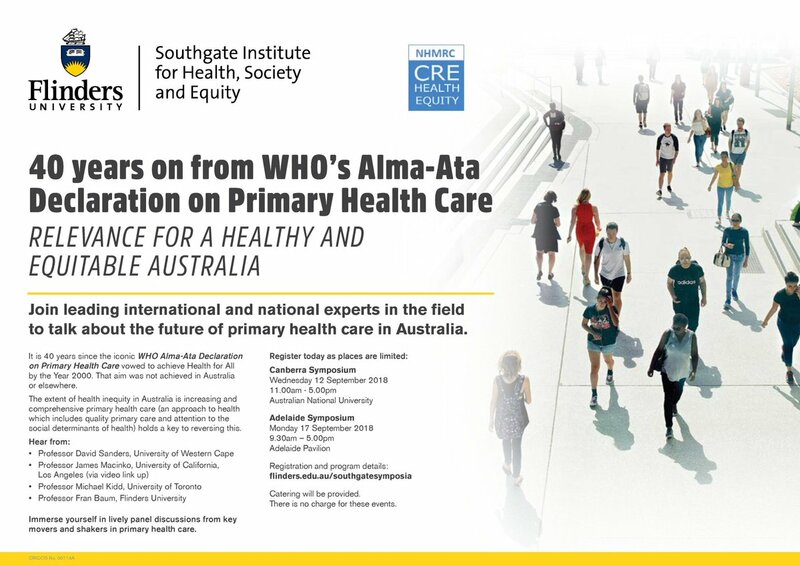 inform service providers, policy decision makers, and the Australian public of the national crisis in Aboriginal and Torres Strait Islander over-representation in out-of home care. garner support to ensure that all Aboriginal and Torres Strait Islander children and young people grow up safe and cared for within family, community and culture. 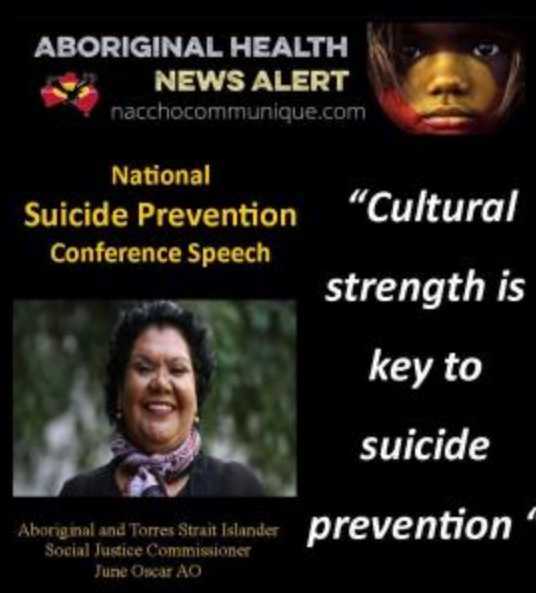 ensure that Aboriginal and Torres Strait Islander families, communities and organisations are empowered to exercise their responsibilities for the safety and wellbeing of their children. We need a new approach. An approach that trusts Aboriginal people to deal with Aboriginal business, one that includes genuine collaboration and partnership, empowers communities and involves long-term all of government support across the country. We must secure access to quality universal and targeted services necessary for Aboriginal and Torres Strait Islander children to thrive. We need to make sure that our laws, policies and practices are culturally safe and responsive to the needs of Aboriginal and Torres Strait Islander children, and to ensure this happens, governments and services need to be held accountable to Aboriginal and Torres Strait Islander people. 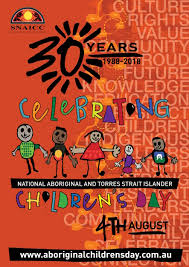 Aboriginal and Torres Strait Islander children have grown up safe, well and cared for in their families, communities and cultural traditions, for thousands of years. Evidence shows the value of unique Aboriginal and Torres Strait Islander child rearing practices, alongside the critical importance of continuity of cultural identity to the wellbeing of Indigenous children. Without real change now, the story remains the same. It’s time for new approach. Learn more by downloading the Family Matters Roadmap. Please look out for Family Matters on social media during the Week of Action and add your voice to our call for a better system! Visit our social profiles below to like and follow us ahead of the big week. 20 May Please help Zibeon get people back home for treatment and give generously to help open the doors to the first remote dialysis clinic on the APY lands. Zibeon Fielding is a 24 year old man from Mimili Community and an Aboriginal Health Worker at ‘Local’ in the far-north-west region of South Australia on the Anangu Pitjantjatjara Yankingtjara Lands(APY). Zibeon is determined, passionate and wants to help his people live long, healthy and happy lives. In 2016, Zibeon was selected into the Indigenous Marathon Project (IMP), a foundation established by World Champion Robert De Castella. A testament to his determined spirit, Zibeon tried out for the squad for four consecutive years before being accepted into the program. Zibeon has now trained under the IMP, completed a New York City Marathon and is now taking on his biggest challenge yet. Please help Zibeon get people back home for treatment and give generously to help open the doors to the first remote dialysis clinic on the APY lands. Zibeon’s challenge….and dream, is to run an Ultra Marathon – 62km from his community of Mimili, to neighbouring Indulkana. It’s a long, long way…the length of ONE AND A HALF MARATHONS through harsh desert country and further than he has ever run before. With the support of the South Australian Film Corporation, Zibeon is filming his journey towards the run and will share the mental and physical obstacles he endures. He will reveal what’s required to push the boundaries of ones physical capacity and provide an educational journey that allows the audience to share his pain, moments of doubt and absolutely dogged perseverance. Zibeon will start his run on 20th of May. 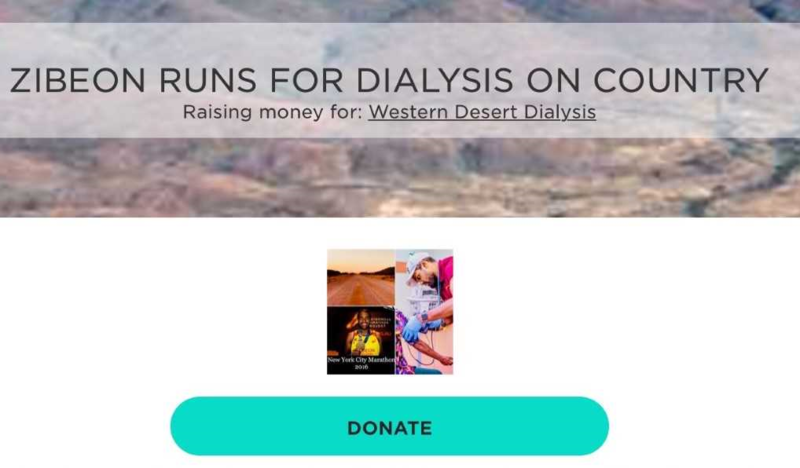 The ultimate goal is to raise $50,000 for The Purple House – Western Desert Dialysis. The money will be used to help get the doors open at the first remote dialysis unit on the APY lands – Pukatja / Ernabella SA. Opening in 2018, the new dialysis unit will provide much needed ‘on country’ dialysis for Anangu people. Indigenous people from remote Australia are being diagnosed with kidney failure at unprecedented rates and without ‘on country’ treatment options, dialysis patients are forced to relocate Alice Springs or Adelaide…many miles from home. With every step he takes…millions over the 5 months training and 5+ hour final ultra marathon, Zibeon is striving to bring about positive change to all those he cares about and even to those he doesn’t know yet. Zibeon hopes to reconnect old people with their homes and inspiring young people to do right by themselves. With your help, Zibeon will get the doors open at the new Pukatja Dialysis Unit and start to bring people home to country and their families. 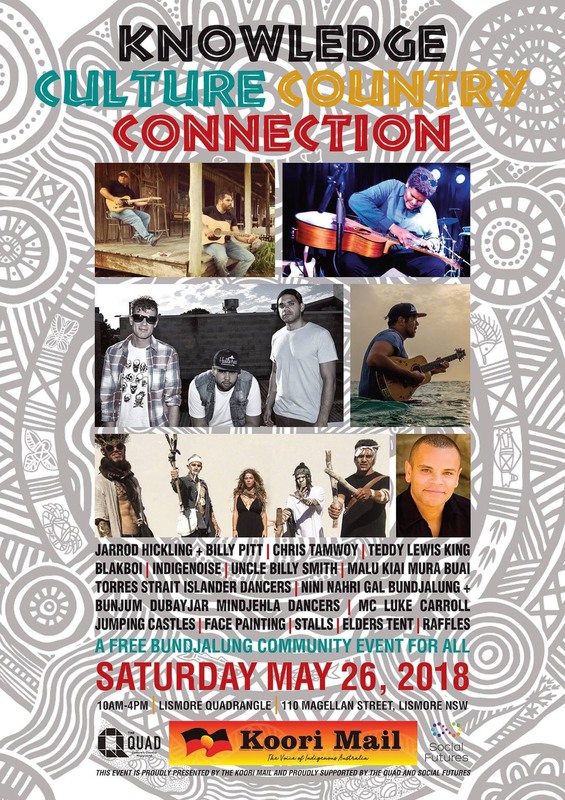 THE Koori Mail, Australia’s only national Aboriginal and Torres Strait Islander newspaper, proudly based in Lismore on Bundjalung country, presents Knowledge, Culture, Country and Connection, a free community event on Saturday, May 26, in Lismore. 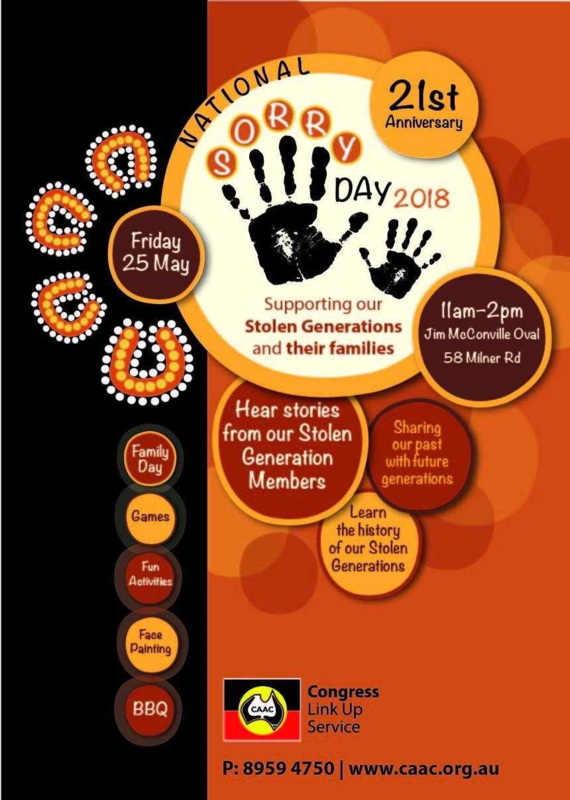 The event will celebrate 27 years since the first edition of the Koori Mail in 1991, and will also mark National Reconciliation week. Local organisations and service providers, businesses and community groups will participate in the day, with the Koori Mail board of directors hoping the event will bring together communities across the Bundjalung nation to enjoy a showcase of music, dance, and much more. Musicians and performers on the day include local Bundjalung acts Teddy Lewis King, Indigenoise, Uncle Billy Smith, Jarrod Hickling and Billy Pitt, and Blakboi. Guitar sensation Chris Tamwoy will also perform on the day, which will be hosted by actor and entertainer Luke Carroll. 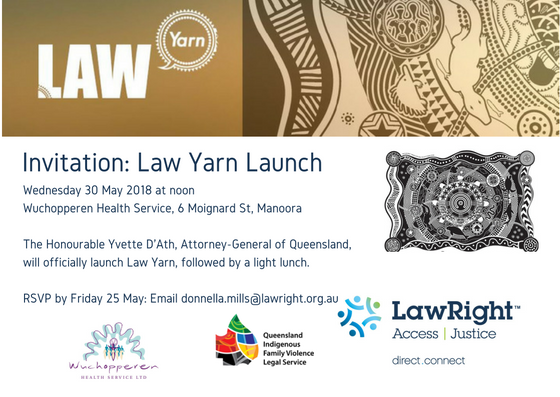 The event will be held at Lismore’s Quandrangle (Lismore Regional Gallery), from 10am to 4pm on Saturday, May 26. Knowledge, Culture, Country and Connection is proudly 100% funded by the Koori Mail, the voice of Indigenous Australia. *Please feel free to share. The dates for the conference are the 11 – 12 July 2018 at UNSW Kensington Campus in Sydney. Please note the $350 Conference Registration for 2 days or $175 for one day is non- refundable or transferrable. 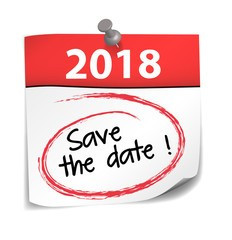 The Conference Dinner is optional on Wednesday 11 July 2018 at 7.00 – 11.00pm cost is an additional $80.00. 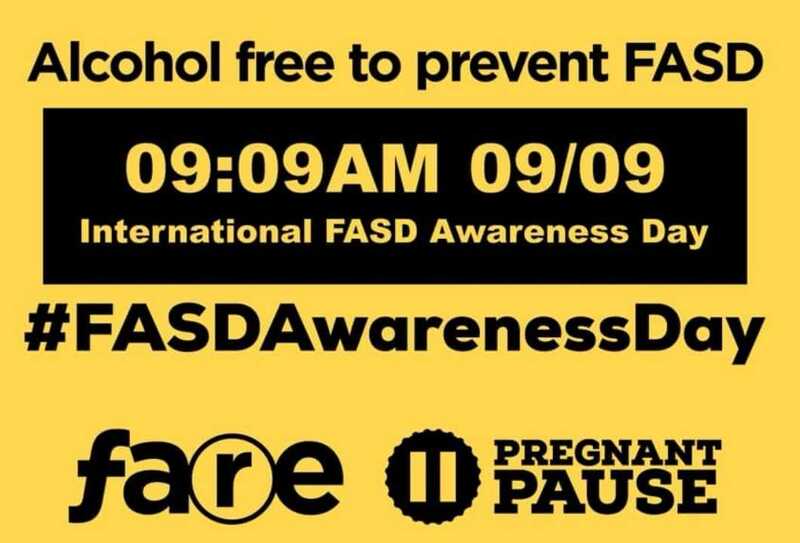 food and entertainment will be provided (this is an alcohol free event). The Dinner is open to all Conference Delegates including Sponsors (so blokes are welcome) Details will be posted at a later date. You will be able to choose your Workshops when you Register so please take the time to read Workshop outlines. This Conference is incredibly popular and seats are limited, it will book out so to ensure you don’t miss out BOOK SOON. 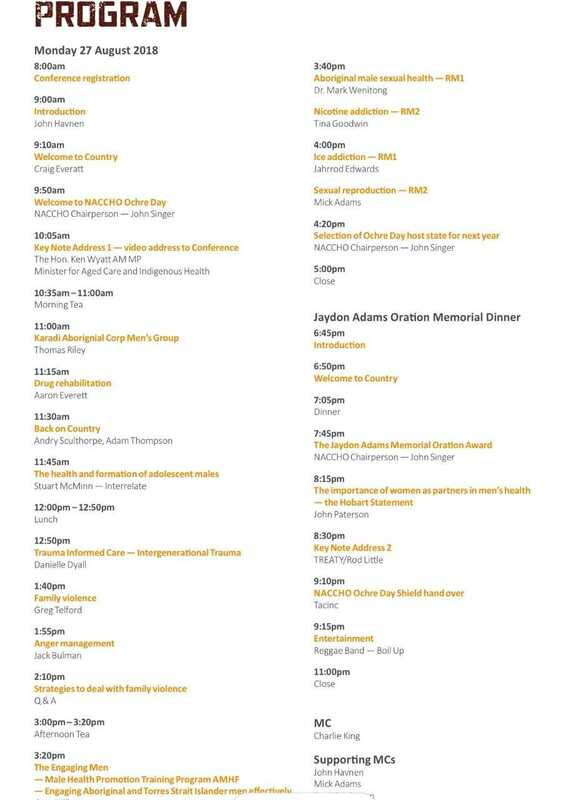 Please note if you wish to purchase tickets to the National NAIDOC Awards Ceremony to be held Friday 13 July 2018 in Sydney. 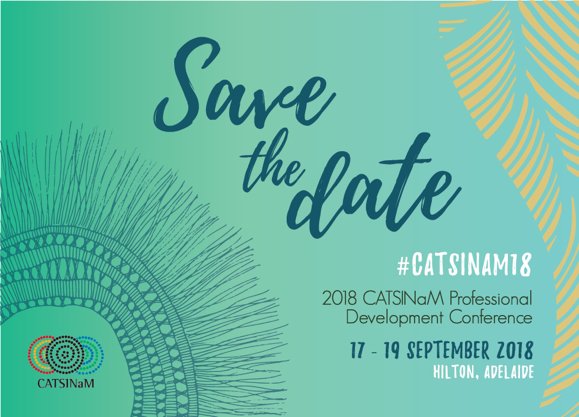 This is a seperate event to the Conference and first release tickets go on sale through Ticketek at 9.00 am AEST on Thursday 3 May 2018.Second release tickets go on sale at 9.00 am AEST 10 May 2018. Cost of tickets is $185.00 or $1,850.00 per table. A huge thanks to our Sponsors: Reconciliation Australia, UNSW, Rio Tinto, JobLink Plus, Lendlease, Westpac, Veolia, NSWALC, Griffith Business School, Macquarie University, Accor Hotels, Warrikal, PwC Indigenous Consulting, Gilbert and Tobin and National Library of Australia.